Irish Whiskey is called in gaelic "Uisce Beatha" meaning "water of life". It was one of the earliest distilled drinks in Europe, dating back to the 12th century. It is thought Irish Monks brought the technique of distilling perfumes back to Ireland from Mediterranean countries and the Irish used this technique to distill whiskey. Modern Irish whiskey is similar to Scotch whisky, but it is distilled three times instead of two and it is matured for around five years; for this reason it is sweeter and it has no smoky or earthy overtones. 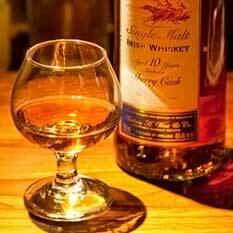 In Ireland there are several types of whiskey: single pot still, single malt and single grain. The most famous Irish whiskey is Bushmills in Cork, but there are others well known such as Jamesons, Powers, Paddy, Redbreast, Connemara, Tullamore dew and Green Spot; others are less known, but they have delightful aromas and flavours such as Kilbeggan, Millar's, Cooley and Tyrconnell. Drinking toast is a common Irish custom and as in every country in the world, the Irish have their form of cheers: "Slainte" or "good health". "The health of all Ireland and of County Mayo, and when that much is dead, may we still be on the go." Sometimes toasts may be accompanied by drinking songs. Here is one of the most popular Mayo's Drinking song: The Boys from the County Mayo. A good Irish Whiskey is the main ingredient for a nice Irish Coffee.